The Auxerrois is a white grape native to Lorraine that also likes Alsace and the Loire Valley where its expansion began in 1950. Its name comes from the nurseries of Auxerre where it found shelter during World War II. 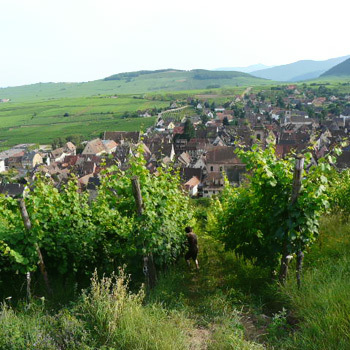 Often called “Pinot Auxerrois”, it is part of the Moselle, Alsace, and Côtes-de-Toul AOC vineyards. It is also used making Crémant d’Alsace. Auxerrois must not be confused with Cot or Malbec, which are red varieties from the Cahors region and may have the same name. The Auxerrois bunches are of medium size with small berries. It is a semi-late varietal whose buds only come out when temperatures are well above 10°C. This wine is a mystery, with its powerful fruitiness, its spices, its candied accents, its haughty demeanour and yet, it keeps a certain density of matter. Magic conjured into a glass of wine..